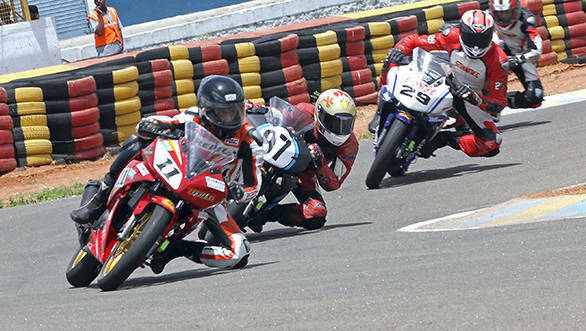 MMSC will host the fourth round of the MMSC FMSCI Indian National Motorcycle Racing Championship on September 5 and 6 at the MMRT in Chennai. The weekend will see 20 races over the two days, with close to a 100 entrants in all. The main attractions include the Group B (Open) category, the Group C (Open) category and the Group D (Novice) category. Along with them are the one-make championships held by Honda, Suzuki, Yamaha and TVS. The last two manufacturers made their way into the championship only in the previous round. In the Group B (Open) class, there will be a tough fight for the championship lead between Harry Sylvester of TVS Racing (69), Rajini Krishnan of Moto-Rev Yamaha Racing (68) and Jagan Kumar, also from TVS Racing (62). Sarath Kumar, who is just behind the trio in the Group B class, is doing much better in the CBR250 category of the Honda One Make Championship. He leads the championship after a double win in the previous round, which gave him an overall score of 86 points. In the CBR150 category Sivanesan S from Chennai leads the scoreboard with 80 points. The Group C (Open) category sees Ananth Raj of Kingdom Racing India lead comfortably with 95 points ahead of Sumit Lucas Toppo of Prolap Racing who stands at 73 points. However, Sumit is closely trailed by Shyam Shankar of Thunderbolt Racing (71) and Mathana Kumar of Ten10 Racing (68). Moto-Rev Yamaha Racing's Kannan K leads the Group D (Novice) class with 62 points followed by Aravind B of United Tech Racing and privateer Shane Thompson (57). In the Suzuki Gixxer Cup Novice class, Vishwadev Muraleedharan and Amarnath Menon sit at a close 1-2 with 119 and 117 points respectively. While in the Open class of the Suzuki Gixxer Cup, Ananth Raj (106) and Abhishek Vasudev (94.5) lead the scoreboard. KY Ahmed and Akhand Pratap Singh achieved double wins in the Open and Novice categories of the TVS One Make Championship, putting them on top. The Yamaha One Make Championship has Mithun Kumar and Kannan K at the top of the Open and Novice categories. 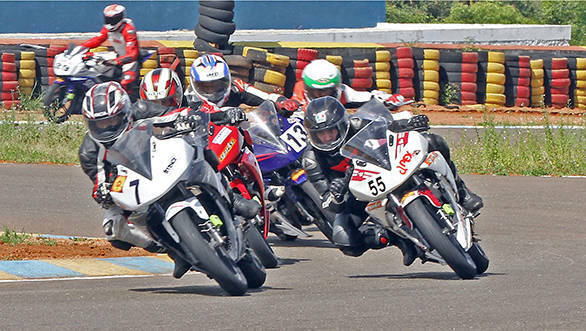 CHENNAI: Nearly 100 entrants will line up on various grids in the fourth round of the MMSC-FMSCI Indian National Motorcycle Racing Championship that gets underway on Saturday at the MMRT track, celebrating its silver jubilee year. The busy weekend will see as many as 20 races spread over Saturday and Sunday. The National Championship is headlined by the premium Group B (Open) class besides Group C (Open) and the ever-popular Group D (Novice) which has never failed to attract big numbers. Also in the racing mix are the One-Make Championships involving India's top two-wheeler manufacturers, Honda, Suzuki, Yamaha and TVS, which have provided a viable and affordable platform for young aspirants whose numbers have been growing with each round. Suzuki made an entry into racing this season with the Gixxer Cup (Open and Novice) while Honda have two categories, the CBR 250 and CBR 150, as also TVS, fielding the Apache RTR 160 and Yamaha with their R15. The Group B class which has the best of Indian talent and riders with international honours, has dished out quality competition as just seven points separate the top three on the leaderboard, Harry Sylvester of TVS Racing (69), Rajini Krishnan of Moto-Rev Yamaha Racing (68) and Jagan Kumar, also of TVS Racing (62). Behind the trio is another rider with international exposure, Ten10 Racing's Sarath Kumar who, despite just one podium finish in four outings, has been showing definite signs of catching up with the front-runners on his Honda which is still a work in progress. Sarath, however, is having a better run in the Honda One Make Championship where he heads the CBR 250 class with 86 points following a double in the previous round while Chennai's Sivanesan (80), who has two wins to his credit, leads the Honda CBR 150 category. In Group C (Open) class, Ananth Raj of Kingdom Racing India team with 95 points, enjoys a comfortable lead over his nearest rival Sumit Lucas Toppo of Prolap Racing (73) while Shyam Shankar of Thunderbolt Racing (71) and Mathana Kumar of Ten10 Racing (68), the only rider with two wins, are within striking distance of the leading duo. Kannan K of Moto-Rev Yamaha Racing is ahead in the Group D (Novice) class with 62 points, only one ahead of Aravind B of United Tech Racing. Ranged behind the leaders are Privateer Shane Thompson (57) and Sparks Racing's Vishwadev Muraleedharan (50) who had started well with a double in the first round but went without a point in the next two. 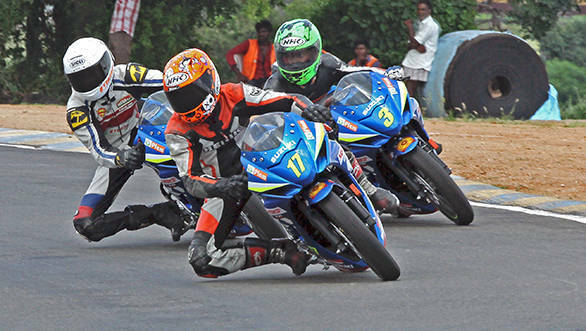 With three wins apiece, Vishwadev Muraleedharan (119) and Amarnath Menon (117) are in a tight race for honours in the Suzuki Gixxer Cup (Novice) while Ananth Raj (106) and Abhishek Vasudev (94.5) are sitting pretty in the Open class. TVS and Yamaha returned to the One-Make Championship only in the previous round. KY Ahmed and Akhand Pratap Singh achieved a double each in the TVS Open and Novice categories, respectively while Mithun Kumar (Open) and Kannan K (Novice) moved into early lead in the Yamaha series after the first round.